And now I can die happy. I just discovered Spoonflower. A website where you can design and print your own textiles. The brilliant parts: No minimum order. $18 per yard. 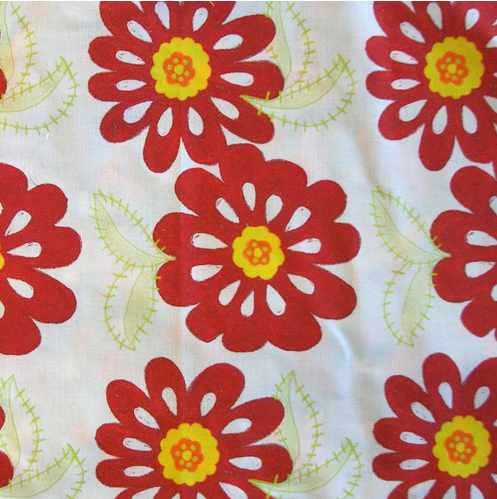 Printed on quality quilting-weight cotton from Moda. And fast turnaround — I’ve heard less than two weeks is not unusual. In theory, I could develop a line of textiles (which I’ve been dreaming of doing for over a decade) for a startup cost of hundreds instead of thousands of dollars. Thank you very much for the link, Laurie. I’m off to daydream about fabrics for the rest of the day. Thank you for sharing this!!!! I am so excited to check this out, I’m in the BFA graphic design program at BYU and am planning on designing fabrics for part of my final show, but haven’t found the best way to do it yet. So, this could be the answer! Thanks again. i ordered my first spoonflower fabric about 2 weeks ago &amp; it has already shipped! like you, design mom, i have always dreamed of starting my own textile line-so i sent one design in to spoonflower to check the quality/execution…and assuming it&#39;s as great as i think it&#39;s going to be, it&#39;s off we go! i&#39;ll let you know how my first fabric looks when it comes in later this week! oh, go for it! I’d like to see some fabrics designed by you (in your spare time- ha, ha). How cool! Oh the possibilities…love it. i think i just died and went to heaven. this is EXACTLY what i have been needing. i am re-doing my son’s room from baby to toddler and can’t find sheets that i like to match the paint i want. and now…i can design the fabric and make the bedding myself! A W E S O M E. if you were in front of me, i would give you big smooches for posting this! thank you. Oh my gosh… I can’t believe what I’m reading… I was wishing this very wish last week, that I could have my own designs on fabric…! Could it be true???? PS – I LOVE your blog, only recently found it via Sarah Jane Studio’s blog… keep up the good work – I am duly inspired every time I visit. Isn’t it fantastic? I’ve been contemplating this for a few weeks now but find myself crippled by the endless possibilities. I’ve had a crush on spoonflower since beta. oh my gosh, no way! how awesome! Just wanted to say Spoonflower is fantastic! I had my kids each draw their “best drawing” and I turned it into fabric on Spoonflower which I then made into duvet covers as gifts for them. Of all the gifts they received I know this one rocked–OK Guitar Hero was a close second but seeing their faces when they saw their drawings immortalized…priceless! Beautiful Pattern!! I need to do something like that as soon as possible. My friend recommond a website called KarmaKraft to me. They’re incredible can offer several different cotton and also linen and silk!!! I plan to make a silk dress this summer!! The one on their home page is cute! !